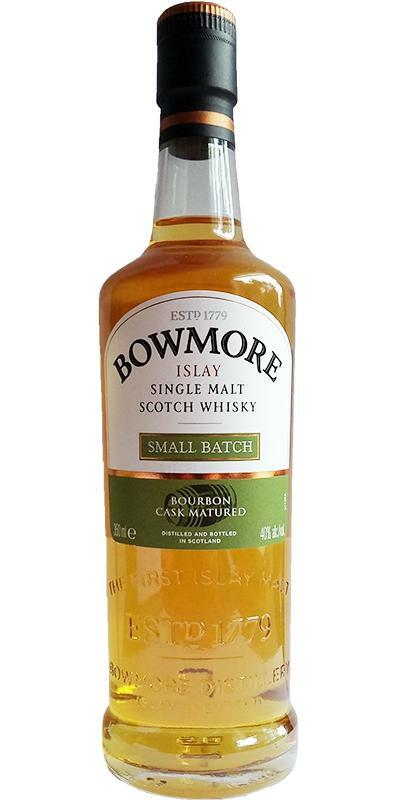 Nice young 'bowmore', especialy for this price. Light, sweet, honey and vanilla. Little floral finishing with wood and smoke. Light again but elegant and easy. Nice balance, honey sweetness for a while and later on more smoke and wood is coming through ending with a little biterness in the back. Medium with a delicate light smoke drying out in the end. Again, one without age, but an interesting one. Quite impetuous & yet provided with a few small finesse. An Islay for the summer. A light hint of salty sea air, very light industrial smoke in the background, a bit of vanilla pod ,. Some kelp garnish with a few crumbs of toffee. Adding water, the smoke is swept by a slight sweetness. In addition very slight oak notes. Saltwater & custard. Good smoky on the palate. Soft caramel, bourbon vanilla & gentle oak tones. With water a juicy saltiness, smoke, vanilla, salty caramel and a hint of wood. Dense clouds of smoke over a carpet of soft caramel. The whole sprinkled with vanilla and a pinch of salt. Water offers light medical notes, quite salty caramel, lemon juice (maybe lime), a few splashes from a puddle of beach; ended with a slight dryness. Nose - Peat, light smoke, fennel, oily and sugar cane. Taste - Light peat, clean, oily and medicinal herbs. Finish - peat and medicinal herbs. Comment - Clean, no oak I can detect, well made for a young malt. Nothing wrong with it but personally it's not my style of whisky, I like. I was given a bottle of this from a Bowmore fan/ friend - who really felt life was too short to drink whisky you don't like. We tasted this at a whisky evening and found it very 'tight'. We were presented with a very distinctive estery smell. A little like yatch varnish without the nip and certainly not unpleasant. Perhaps in the line of ripe bananas? but very unyeilding - no amount of warming and waiting in the glass seemed to open the dram up. Sure - it was smooth and drinkable. A month or so later I retasted it and it reminded me of the Jura superstition, with a feint pleasurable whiff of peat smoke. I tried to give it back to its original owner, but he was having none of it. Bowmore Tempest Batch 2 - now that's a dram worth seeking out! 82 points - one of my lowest marks. not bad but nothing more. The nose is very pleasant. Waxy, with wood, fresh apple and a hint of cinnamon. The nose is fresh and pleasant. we believe ourselves at times in a craft store (wax, rough wood, sawdust, candle ...). Alas, we are below the nose. It's very simple and a little grassy. Too diluted too. Texture slightly oily and a little sweet, with green apple, a lot of wood, maybe this side "tar licor" between the tar and the plastic. Long for 40%, spices, herbs, some wood and tar. Fresh, peat, iodine, a little lemon. Interesting for the price.